Senior Pastors Graham and Tui Cruickshank are experienced ordained ministers of the gospel, having served nearly 40 years in Holy Spirit honouring leadership. Pastor Graham is well known for the depth, life and maturity of his teaching ministry. He has served 30 years as a Bible College Principal, assisting many over that period in gaining a deeper understanding of their faith in God. Pastor Graham’s Bible and Leadership courses are also currently being used to train many leaders in other nations. 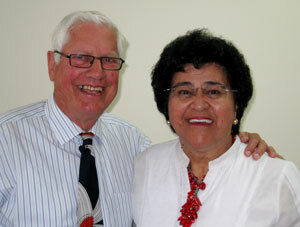 Pastor Tui is well known for her people focus, having a real heart for the poor and needy and for those broken in life. Her hospitality is legendary. Pastor Tui is a powerful prayer warrior and intercessor and a very active witness for Christ. Her ministry carries a keen prophetic edge. She has fully shared in all the pioneering hardships associated with pioneering in three nations and is a seasoned warrior in the gospel ministry. We now have a new Assistant Pastor John Helagi, Here are his contact details: Phone 09 438 6821 or 021 171 5741.